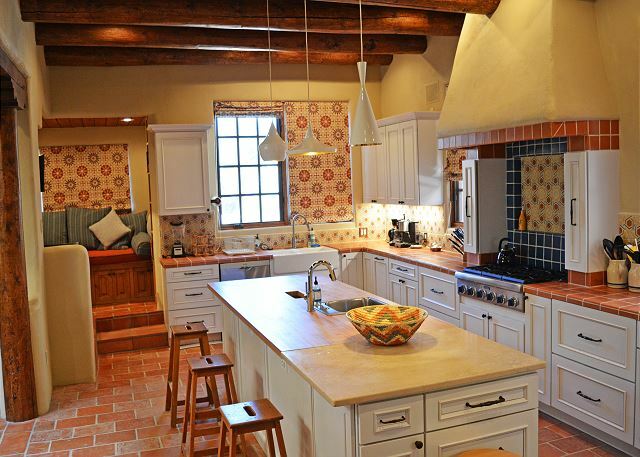 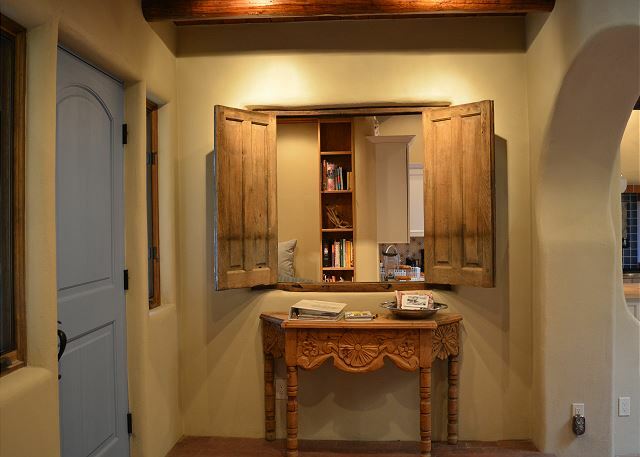 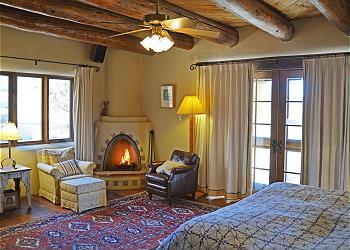 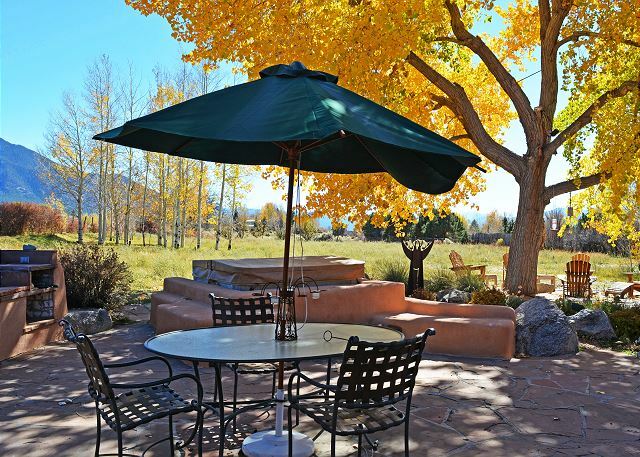 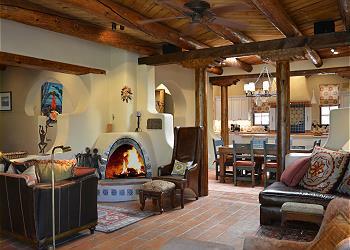 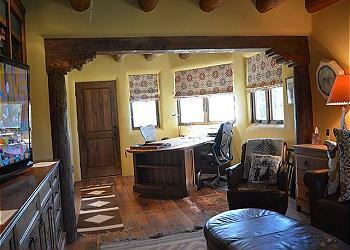 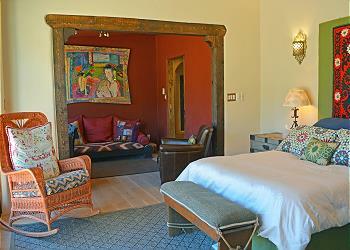 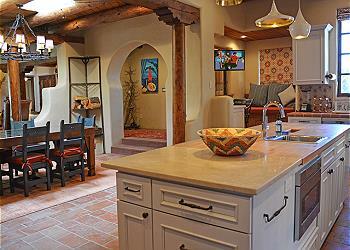 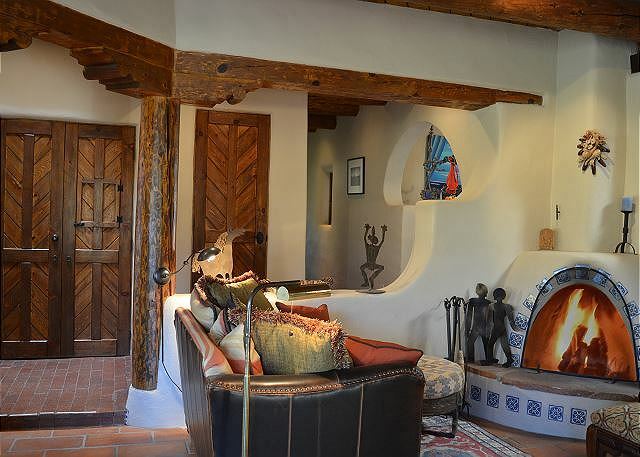 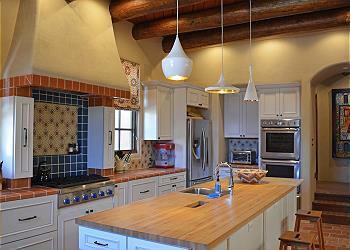 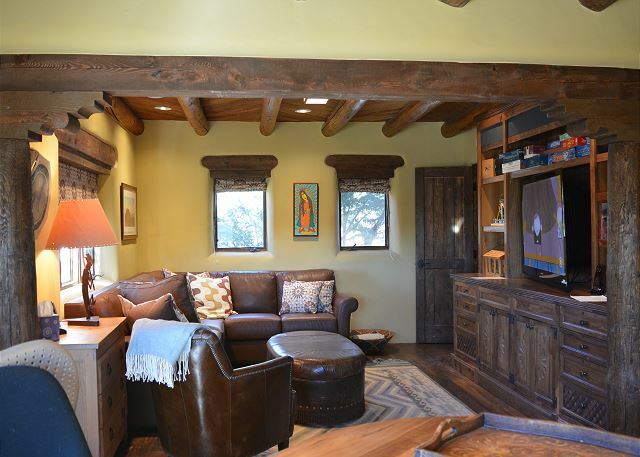 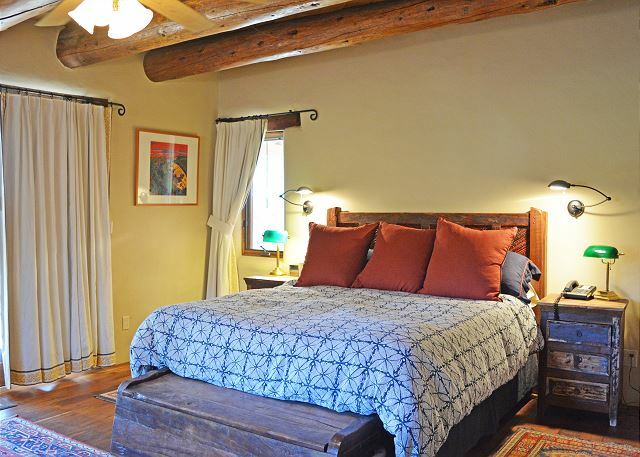 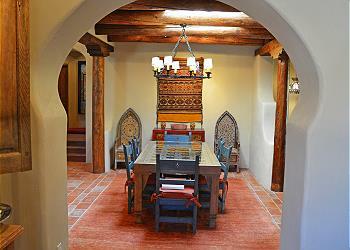 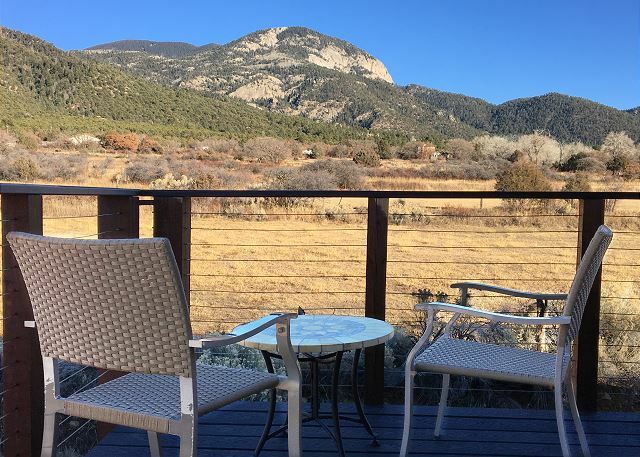 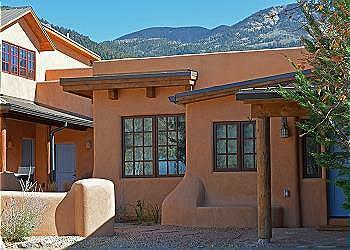 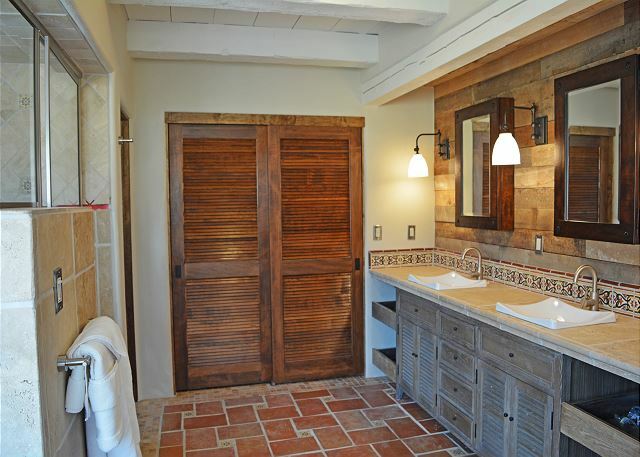 Casa de la Valle Luna is a luxurious and charming private residence nestled at the foot of the sacred Sangre de Cristo Mountains, conveniently located midway between the town of Taos and the Taos Ski Valley, near the charming, small town of Arroyo Seco. 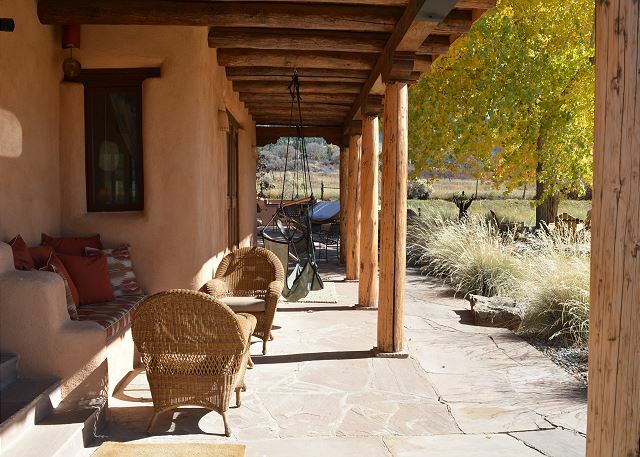 Opening onto acres of open fields with mountains near and far, Casa de la Valle Luna provides a revitalizing sense of peace and privacy. A perfect blend of traditional charm and contemporary comfort, Casa de la Valle Luna combines authentic adobe and viga construction, floors of terracotta, brick, walnut, and oak, decorative tilework, and wood-burning Kiva fireplaces, with the modern comforts of radiant heat, hi-speed WiFi, Sonos-controlled music for each room, and satellite-linked HD TV's throughout. 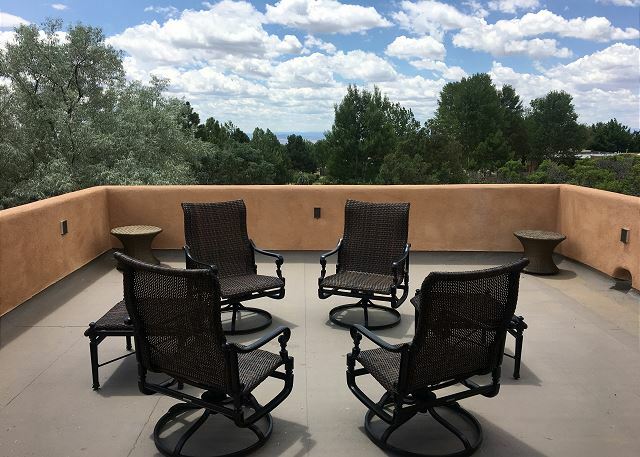 Many say the most truly memorable feature of Casa de la Valle Luna is the expansive and beautifully landscaped patio, featuring an outdoor hot tub, wood-burning fireplace, built-in gas grill, and multiple seating areas. 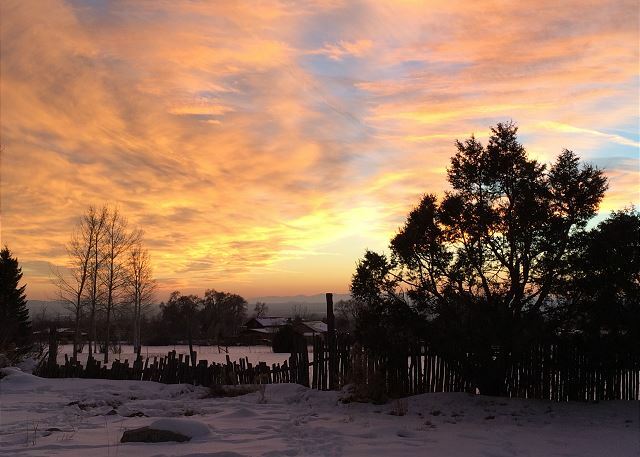 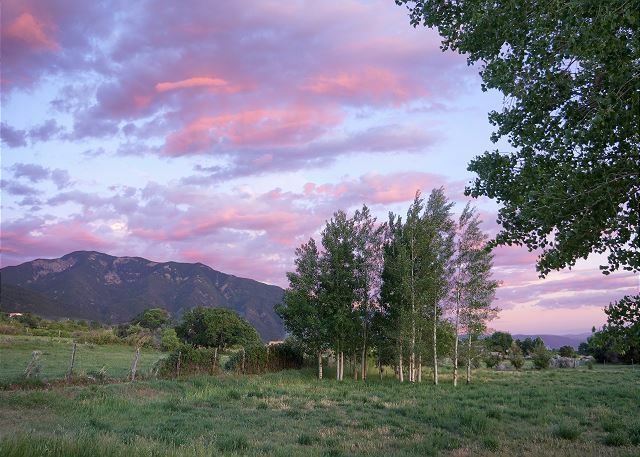 Facing sacred Taos Mountain, surrounded by acres of open fields, and shaded by a massive cottonwood tree and groves of aspen, you will be transported by the sunrise-to-sunset views, ever-changing cloudscape, and enchanting bird-song. 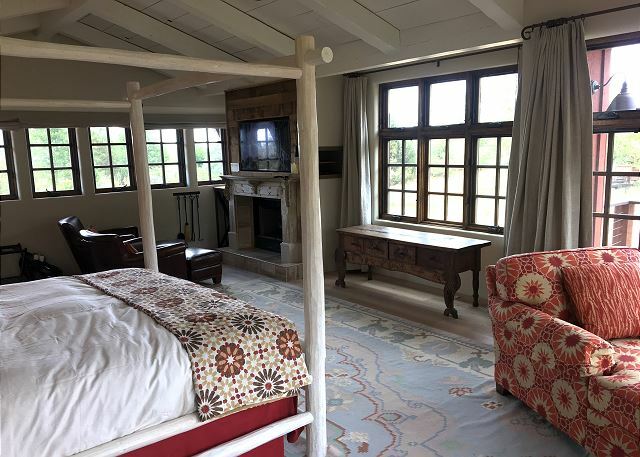 The Main House includes three private suites and a convertible media room/office, each situated in its own wing of the house, and each with its own bedroom, full bathroom (with beautifully tiled, walk-in showers,) and seating/lounge area. 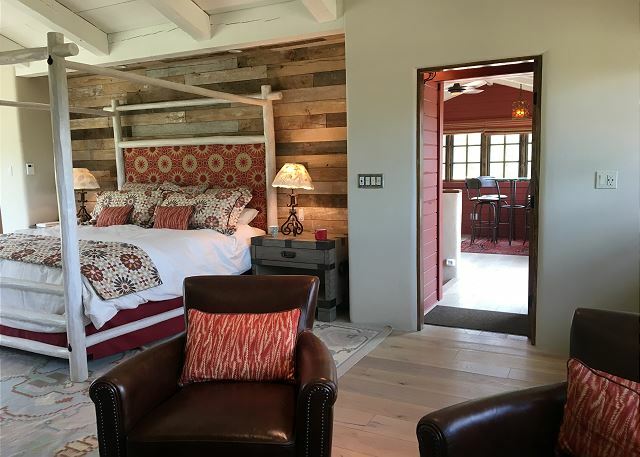 The Downstairs Master features a California King bed; the Mountain View Suite and the Patio Suite each have Queen beds; and the convertible media room has an American Leather Queen sofa/sleeper with a shockingly comfortable Tempurpedic mattress. 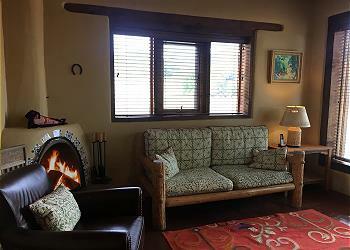 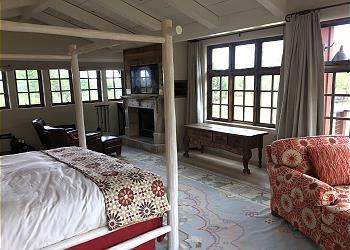 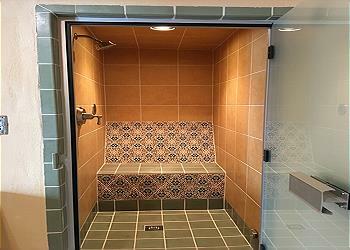 One of the suites offers the option of a steam shower; one a two-person Jacuzzi tub; two have wood-burning Kiva fireplaces; and one includes a private patio. 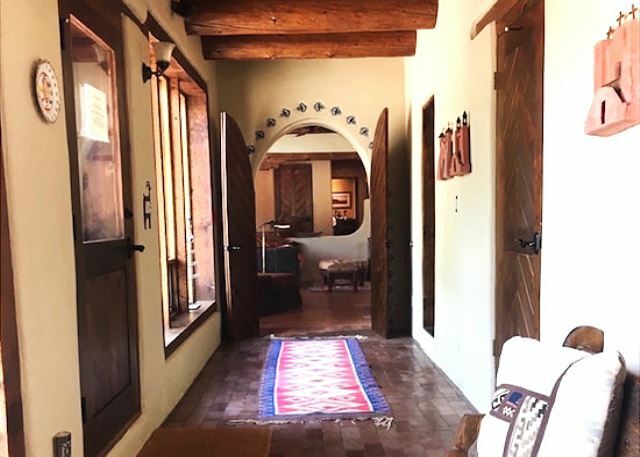 With over 4,500 square feet of indoor living space, the Main House is ideal for three couples, but can comfortably accommodate eight if needed, plus a few kids/young teens on airbeds, or on the large kitchen window seat, or the love-seat in the Patio Bedroom. 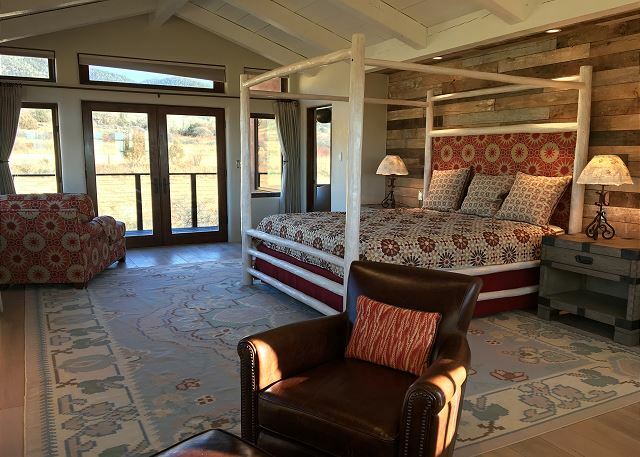 •	The Tower Master Bedroom, with 4-poster California King bed, wood-burning fireplace, arm chairs, chaise lounge, desk, and 180-degree views. 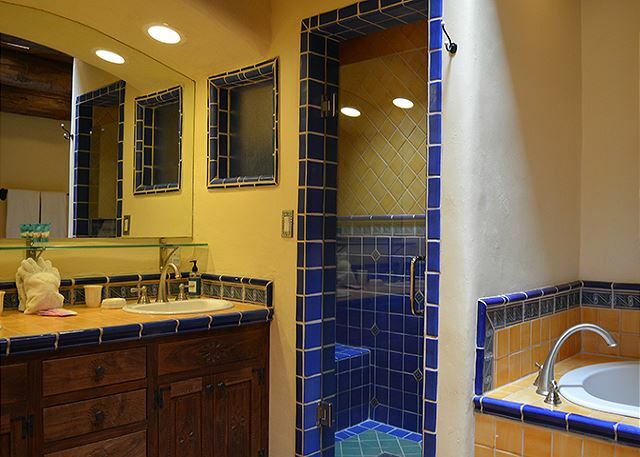 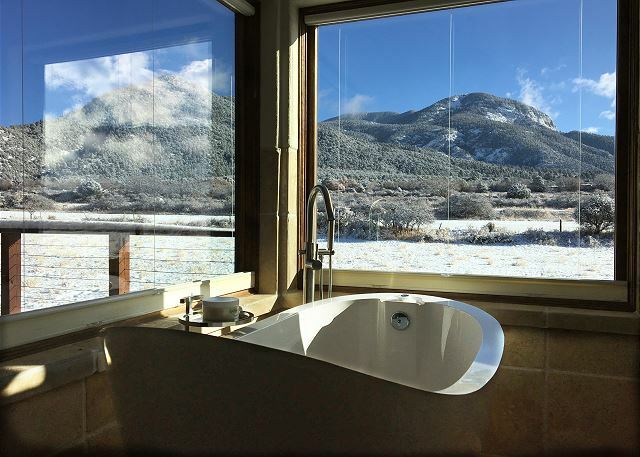 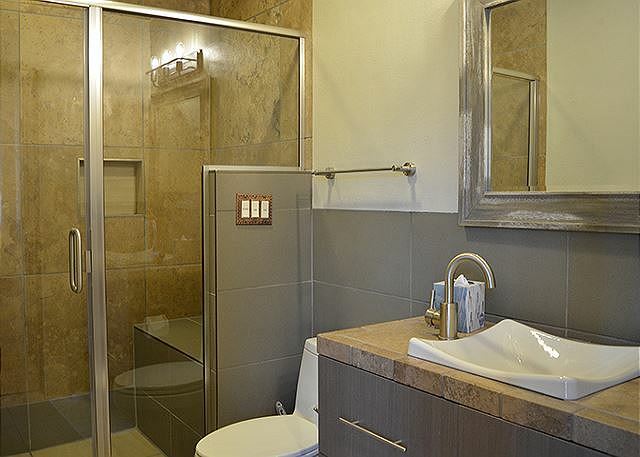 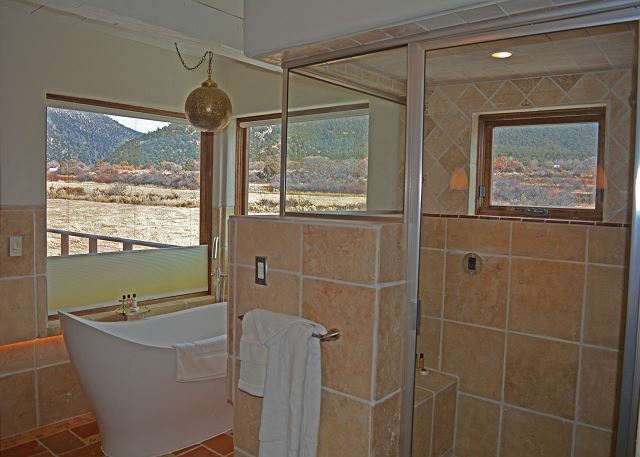 •	The Tower Master bathroom, with his-and-her sinks, walk-in shower/steam shower, and deep soaking tub with a stunning picture-window view of the mountains. 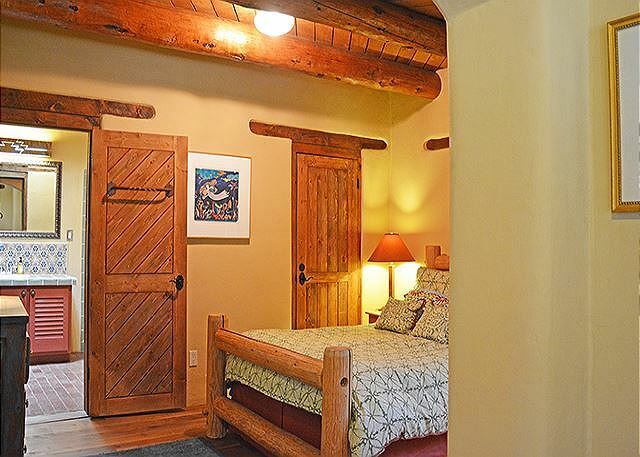 •	Classic, wood-beamed cathedral ceilings, and all the modern comforts of radiant heat, hi-speed WiFi, Sonos-controlled music and satellite HD TV. 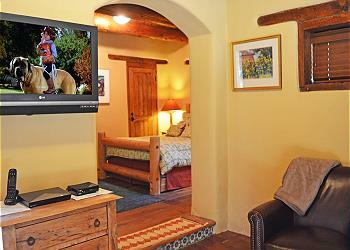 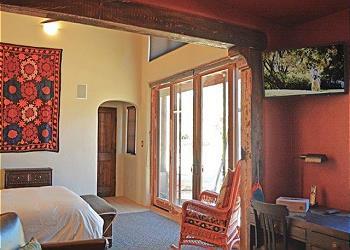 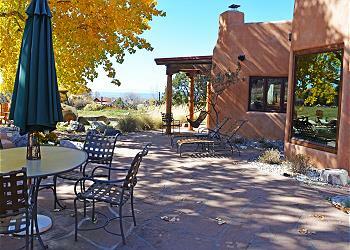 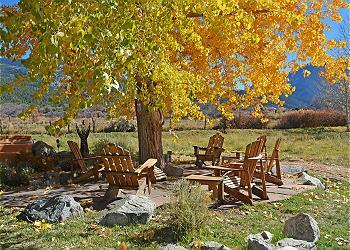 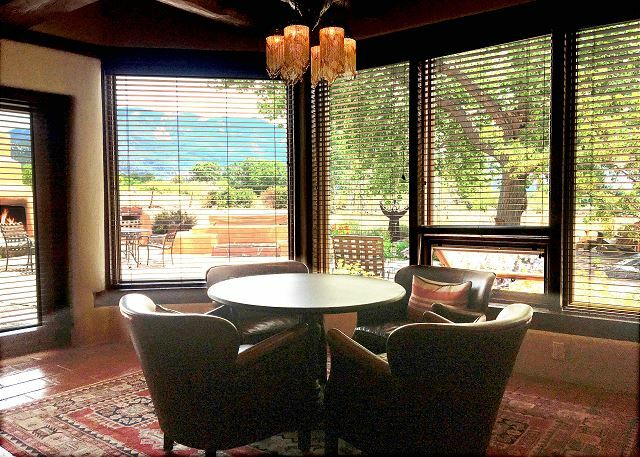 •	Private wrap-around balcony, with sweeping views of fields and mountains. •	The expansive, gourmet Kitchen offers all the conveniences needed to prepare a fabulous meal -- including a 6-burner gas cooktop, double-oven, warming drawer, dishwasher, and massive butcher-block island -- as well as a kitchen nook with window seat, TV, and small computer/task desk. 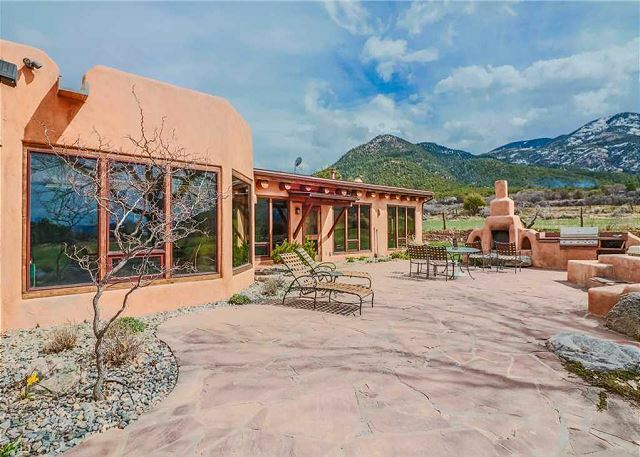 •	The open-plan Living Room and Dining Room provide table seating for eight, a large Kiva fireplace, flexible seating groups, and a game table overlooking the main patio and the mountains. 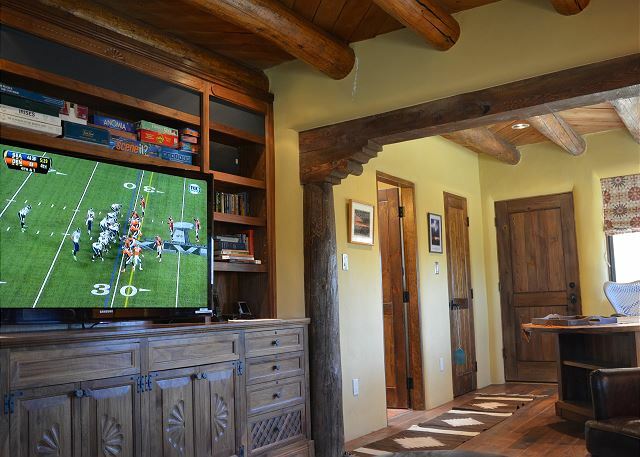 •	The Media Room/Office delivers big-screen, surround-sound viewing for your entire crew, and an office area for desk oriented work. •	The Exercise Room is a dedicated space for workouts, yoga, or stretching, with rubber gym flooring, exercise equipment, and TV. 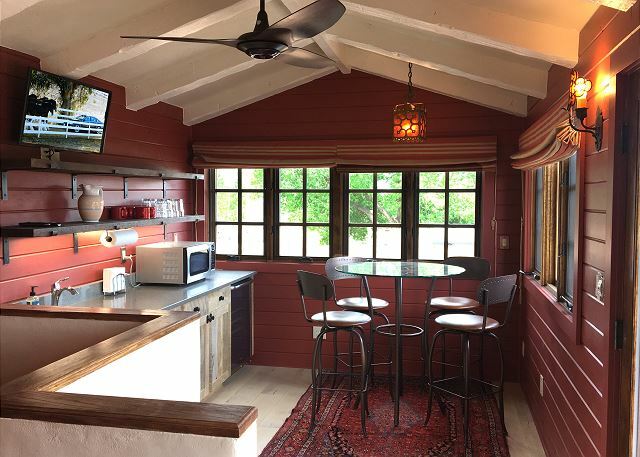 •	The large, 270-degree view Roof Deck satisfies desires ranging from sunset cocktails to fresh air meditation, with a wet bar and indoor table seating in the adjoining Café/Kitchenette.